It’s a fact of life, sometimes people get sick and need antibiotics. And the same is true for pigs. Heather’s family takes good care of their pigs, and this includes veterinary care, and sometimes antibiotics, when they are sick. They think of their pigs like their family – when their kids are sick they go to the doctor, and if they need antibiotics, they get antibiotics. They follow the same philosophy with their pigs. Heather’s family works closely with their veterinarian. The veterinarian comes out once a month to do pregnancy checks on the sows. While he is there, he also walks through all the pig barns to do herd health checks. If there is a sick pig who needs attention between the veterinarian’s monthly visits, he makes an extra trip to see the sick pig. Heather and her family spend a lot of time with their pigs, and they know if one is not acting right, or is feeling sick. They will point these pigs out to the veterinarian, and he will examine the sick pig. If he feels it is necessary, they may do some diagnostic tests (like blood tests) to see what is wrong with the pig and what is the best way to treat it. If a pig is too sick to wait for the veterinarian’s scheduled visit, they may ask him to come out early, or they may discuss the pigs over the phone. Sometimes, a discussion over the phone is sufficient for their regular veterinarian to give treatment advice. Sometimes pigs get infections and need to be given antibiotics so they can get better. Antibiotics are always given under the direction of their veterinarian. Antibiotics can be very expensive, and there is no reason to treat pigs that don’t need the medications. There are three different types of antibiotics that can be used to treat sick pigs. The type a farmer chooses depends on how many pigs are sick, and what they are sick with. Some antibiotics can be given as a shot. Depending on the antibiotic, some need to be given twice a day, or some can be given as infrequently as once every 3 days. A farmer would choose to use an injectable antibiotic when only a very few pigs are sick. Sometimes an injectable antibiotic will be used in a larger group of pigs, if it is the best medication to use and is not available in any other form. It can be difficult to handle pigs frequently, and extra handling causes stress for the already sick pigs. On Heather’s farm, the pigs don’t have any form of individual identification. This is because they are all being sold to a processor in Indiana. However, if a pig gets sick and needs to be given an antibiotic, they need to know which pig that was. First, so they can watch to make sure he is getting better. Second, so they can make sure to follow the withdrawal time associated with the antibiotic. In order to be able to identify the pig that was given an antibiotic, they will mark on his back with a crayon. Then they can keep records on this individual pig – including the signs he was showing when he looked sick, the type and amount of antibiotic he was given, and the date the last dose of antibiotic was given. 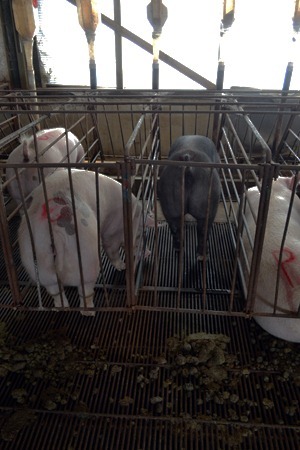 These pigs were actually marked after they were checked to see if they were pregnant (P for Pregnant on the right and O for Open – not pregnant – on the left). Similar marks are used if a pig is given antibiotics. When multiple pigs in the same pen start to get sick, it’s time to start thinking about other ways to give an antibiotic. 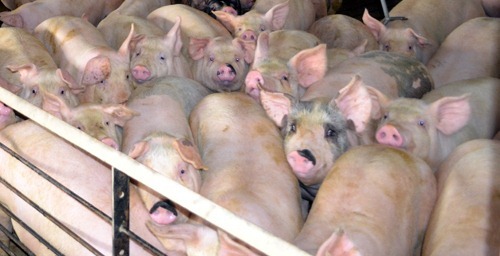 In pens with large numbers of pigs, an illness that starts with just one pig can quickly spread to everyone else in the pen. It’s simply too time-consuming and too expensive to catch every pig, restrain them, and give an injection to each one. And this kind of handling can cause severe stress to already sick pigs. Adding antibiotics to the water is one way to easily get antibiotics to the sick pigs, and to also treat pigs that are in early stages of the illness but may not be showing clinical signs of disease yet. Remember the “control room” that had the water lines for each pen in the building? This is where water-based antibiotics could be added to the water supply. 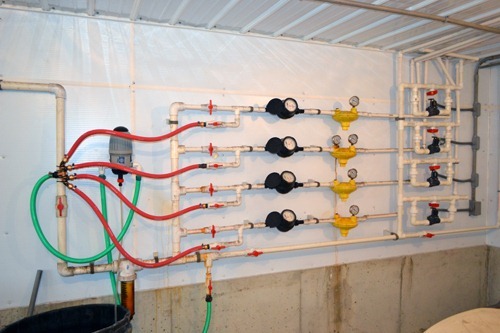 Each water line goes to one room in this barn, and antibiotics can be added to the water of the rooms that need them, without medicating all the pigs in the building. Not all antibiotics can be given in water. In a situation where many pigs in one pen are sick, but the antibiotic of choice cannot be given in water, adding the antibiotic to the feed is a good alternative. Farmers would use feed-based antibiotics in the same situations where they might use water-based antibiotics, but a use a different antibiotic that cannot be delivered through the water. 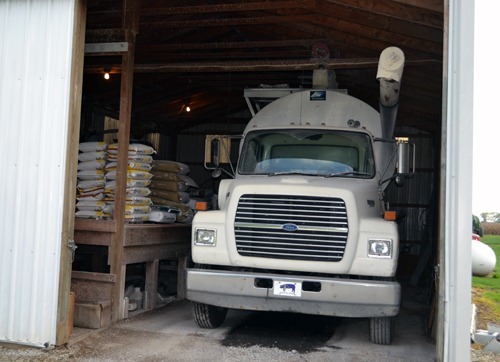 If feed-based antibiotics are used, these would be added in the feed barn. A new batch of feed for that particular pen would be mixed and delivered to the pig barn. Each room in the barns has its own feed storage bin outside, so only the pigs that need the feed-based antibiotics will be medicated. And, just as a reminder, Heather’s family doesn’t use any antibiotics in their pigs without first talking with their veterinarian. We’ve talked before about using hormones in dairy cattle to help them produce more milk, or using steroids in beef cattle to help them grow faster. We also looked at package labels on pork that say “no added hormones or steroids.” The fact is, pig farmers can not give their pigs any hormones or steroids. It’s illegal. These pigs only need to make enough milk to feed their piglets for 3 weeks – they don’t need any help from us to do that (other than a balanced diet and plenty of water). Pigs already grow very fast (280 pounds by the time they are 26 weeks old!) and don’t need any steroids to help them grow more lean muscle. As long as farmers are giving pigs a proper diet, with added amino acids (the building blocks of protein and muscle), pigs will grow without the need for any extra medications. I can not give veterinary advice online. Please contact your veterinarian.